Nick D. explains why rerelease developers shouldn’t mess around with the core mechanics of a game unless they understand what made the original tick in the first place. Resident Evil is possibly one of the most ported games ever made: there’s the original PlayStation version, a Director’s Cut, a Dual Shock Version, a Sega Saturn Port, and a Nintendo DS port. That’s on top of other minor ports such as the PS1 Classic on the PSN. It only made sense that Resident Evil would be remade at some point. Surprisingly, the 2002 Resident Evil Gamecube remake (the “REmake”) was not only a good game, but it is my go to example for how to remake a game properly. It added new modes, new content, and a terrific atmosphere without sacrificing even one iota of what made the original so special. Well, Resident Evil HD came out recently, and there is one new core addition that rankles my chains – they’ve added a new, optional, control scheme. It’s an addition that sounds nice at first blush until you realize that it has no place in the game. The developers of the re-release have added a feature that could not work properly with how the original game was made. This subsequent mis-tweaking of video games is an emerging problem as re-releases and remakes are becoming more common and new developers don’t understand the game they are modifying. The original REmake, like the original Resident Evil was designed around tank controls. For those unaware, tank controls were something that developers used to use in order to effectively deal with pre-rendered backgrounds and sudden camera shifts that accompanied them. Here’s how they work: pressing up on the d-pad, analog stick, or keyboard will always propel your character in the direction they are facing, whether they are facing straight, left, or right. Pressing left or right will have your character pivot in place, thus changing the direction they are facing. Pressing back will have the character back up opposite of the direction they were facing at the time. In this way, only up and down will move your character, with the left and right buttons existing purely for directional changes. The reason that such an admittedly unintuitive system was invented was because, with pre-rendered backgrounds, when the camera angle changes, your character could be facing an entirely new direction. However, with tank controls, you’d still always be moving forward even if the camera change means that forward switched from up to right. This allowed certainty of movement, and players could adapt quickly to new directions. With improvements to technology, full 3D environments became more common, making tank controls considerably less useful, to the point where the few PS2 games still relying on the archaic system were dinged heavily by reviewers for it. Nowadays, pre-rendered backgrounds are all but extinct and few, if any, games still use tank controls. Therefore, you’d think that modernizing the REmake by adding a secondary control scheme to get rid of those nasty tank controls would be smart, right? No, actually. You see, control schemes are fundamental in game development. How a character is able to move and interact with the environment impacts each and every part of the core gameplay. Control mechanics aren’t some ancillary part of a game you can change way down the line without repercussions. In this case, Resident Evil and the REmake were both designed entirely around the tank controls. The most obvious way this was manifested was in the game’s liberal use of pre-rendered cut aways. One moment, you’ll be rounding a shadow-cloaked corner to the right, the next the scene will have flipped entirely so that your character is facing forward. Though the HD rerelease allegedly protects against this, in reality, it doesn’t. Your character will continue to move straight with the new scheme, but readjusting to the new camera angle when you want to change directions doesn’t work properly. And it’s not only how one deals with camera angles that has been impacted. Every single facet of the game was built around the tank controls. Take enemies, for example. They move slow and clumsily. With the equally clunky tank controls, however, players needed to be extremely precise and efficient to be able to surpass even the weakest of the zombie hordes. The game was entirely balanced around the player needing time to pivot and turn every time they needed to react to something. A new control scheme isn’t bad, per se, but it ruins all of the balance that went into the original game. Take the Hunter enemy type, for example. This is a reptilian beast, who terrorized many a Resident Evil gamer due to its one-hit-kill jump attack. In the original, the gamer would have to rely on skill to properly avoid a charging Hunter as moving to the left or right was not easy. However, now a quick flick to the right or left is all it takes to defang one of the game’s biggest challenges. It would require an entire new remake full of compulsory balance changes such as making zombies faster and more reactive in order to properly accommodate a new non-tank control scheme. Instead, we have some developers slapping the control scheme on and hoping for the best. This isn’t the first time we’ve had new developers making short-sighted modifications either. Take the Final Fantasy Gameboy Advance remake as an example. Along with fancy new graphics and incredibly forgettable/poorly executed dungeons, the developers revamped the way the magic system worked. In the original, magic was limited by use. In that game magic was divided into levels and each level of magic could only be used a certain number of times before resting up. The amount of use would increase as your level did. In the remake, however, they added the now-traditional Final Fantasy mp system, meaning magic use was tied to a set of points your mages possessed. The change was certainly more convenient, but it broke the game. Now, spells could be used freely without any real conservation. It turned a rather difficult RPG into a complete cake walk. And that was just a minor change. As I said above, this is a problem we’re going to be seeing more and more as the industry ages. Remakes and rereleases are going to continue to be extremely profitable and common, and the original developers of the games are unlikely to be the ones doing the remastering so long after they’ve departed the project. This leaves us with developers who may not understand the thought processes that went into designing the original. New ideas are good (just look how amazing the original REmake is), but they have to be implemented in a cautious and careful way, otherwise the game’s balance could be completely changed. I hear in the back of my head the obvious retort regarding the HD REmake’s new control scheme in that it’s optional. However, that’s not the point. Optional or mandatory, the problem is with new developers making short-sighted changes to old games. The principal behind the objection is equally as important as the impact. Developers need to be careful and considerate of the context in which the game was made. If developer are, then they can create a new version of an old game that will stand tall as a worthy successor. 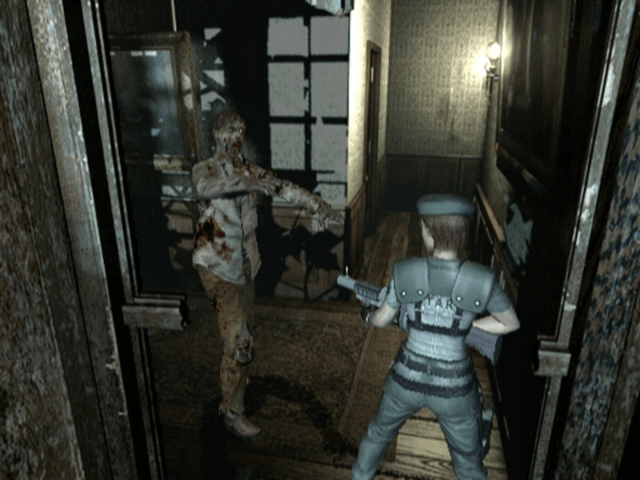 The original REmake developers understood what made Resident Evil so great from a fundamental level. It’s one of the reasons why the REmake was such as successful remake. Otherwise, what we get is a bunch of random features, thrown in for the sake of adding new stuff without a single thought being given for how those features might impact the core experience. At least they did make it optional, instead of forcing everyone to use the new control scheme. It’s funny–I’ve seen diehard survival horror fans discuss how the new controls don’t work well with the fixed camera angles, but then I’ve also seen new players horrified that anyone ever used tank controls. WTF is anyone even crying about the new control scheme works fantastic and is a hell of a lot better than the tank controls I’ve been playing RE0-Code Veronica since 1996….The only people complaining about it are the whiners who just want something to complain about…. First, thanks for the article. Although, I feel your objection to the game’s control scheme is simply just nostalgia on your part. I am old enough that I played and loved all the original Resident Evil 1-3 games as they were released (RE2 is my favorite and I still have my Director’s Cut RE1). Anyway, I remember being so good controlling my character in that game, because I played TOO much. Enough so, that the control became second nature. The input scheme faded into the background by just playing the game (as a good game should IMO). Now, I’m only at the ‘Shark’ stages of the XBox1 version of the REmake – but I’m playing it using the new control methods to see how much it changes the game (went in a skeptic). To be honest, it’s not bad (just different). It has it’s own set of weaknesses, one of which is not being able to simply just back up. Although, I’ll agree with you that it can feel easier playing this way. It’s still jarring when an abrupt camera angle switches and you can’t turn left or right with your current momentum without a physics degree. I respect your opinion, however I feel it is misplaced. Comparing a control scheme update to a Final Fantasy fundamental game changer is also reaching. Being able to change your control method to suit your preferred way of play allows for a larger audience to feel and play your game. Every gamer can play the same game as you – yet at the same time their experience playing said game is completely different. Sorry, but you are absolutely wrong and acting in a patronizing manner. It is totally insane how many people want to dismiss pure game-design aspect of the controls and camera system and turn them into a sorry excuse of the times. That is not how things work, and anyone who leaves their home once in a while should know how much these older games and its closest clones (ie. Silent Hill) are still played and loved to this day. Then there’s the whole idiotic “lol nostalgia!” wannabe argument. I have literally seen dozens of brand new players pick up the old RE and SH games in the past few years alone, getting hang of the controls in no time, and even literally preferring the 3D “tank controls” to the clunky and ugly 2D control scheme.